How to Benchmark Alternative SQL Queries to Find the Fastest Query – Java, SQL and jOOQ. Your units are funny, but maybe you could keep it simpler by scaling all values so that the fastest (or slowest) result for a given database would be 1.0. If you don’t like the idea, then I’d recommend to use furlong per fortnight (you’re measuring speed, right?). A small rant: Assuming there’s really such a thing like 4GL (starting in the seventies), then we should have 20GL by now, shouldn’t we? 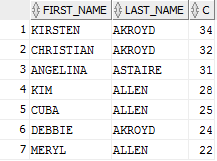 I wonder how it comes that nearly no database “sees” that the queries are equivalent. I’d naively expect, such insight is a prerequisite for optimizations. I did scale the results. There always is a result that is 1.0, I just didn’t display it. Furlong per fortnight sounds reasonable too, will remember for the next time. Yeah, 4GLs should be a trivial thing compared to modern languages. We should all be asking Siri to compute things by now. But we aren’t. There are many reasons why a database doesn’t “see” that the queries are equivalent. Mostly, transformations are omitted because each transformation (especially when cost based) adds a tremendous amount of complexity to the optimisation algorithm, which may already have a hard enough time to figure out the best order of joins. In theory, all these transformations were known in the 70s. In practice, only recent computation power has allowed to actually explore many of them. Perhaps, machine learning will help an optimiser find a better path towards the best plan than costing statistics, though. Can’t every nested query be replaced by a join? I don’t know, but if so, then it could be easiest to do it always so that the optimizer has don’t have to deal with the former at all. The way it works now makes it hard for the programmer: There are different equivalent forms of the same query which leads to different timings depending on the RDBMS and also the current stats. So for the best speed, profiling is necessary, but not sufficient, as the plan may change later with changed stats or even a version upgrade. The same holds for Java microoptimizations, but the microoptimizations are rarely important. And then: do note that the correlated subquery can outperform the join! Yes, Oracle 11g knows adaptive cursor sharing (getting ashamed after a single bad execution) and Oracle 12c knows adaptive execution plans (getting ashamed while executing badly). SQL Server probably has something similar.